There are some amazing tutorials out there for diaper cakes…but what if you want something smaller that you can use as a centerpiece for each table at your baby shower? 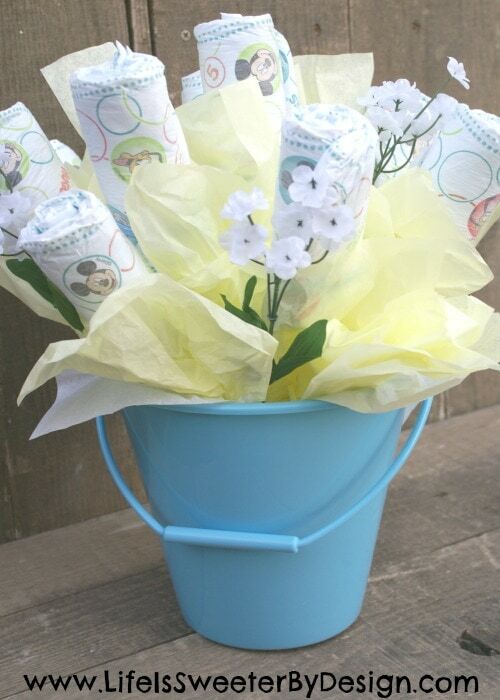 Since it is spring time and I am seeing adorable pails everywhere…I decided to make a Diaper Bouquet in a pail. This is a simple centerpiece idea that you can make any color you choose! The great part is that the centerpieces are useful to the new mommy….because after the shower they can use all the diapers in each pail! First you need to get some diapers! You definitely can't have a diaper bouquet without them, LOL! I love to buy my diapers at Sam's Club because I get the best deal and save time by buying in bulk! 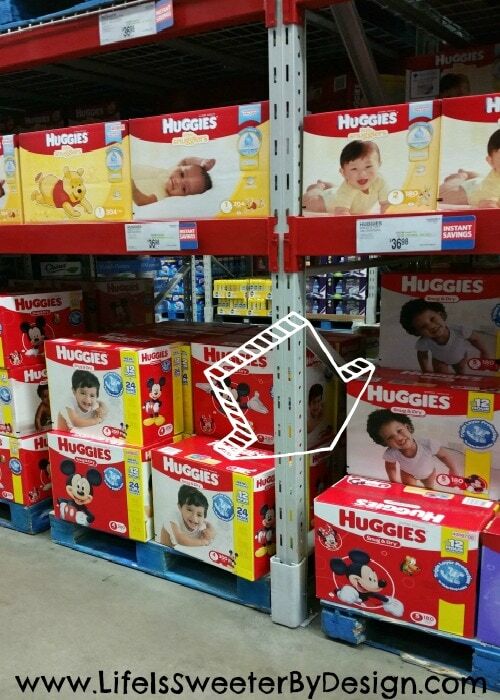 Did you know that Sam's Club Members save $10 on Huggies Snug & Dry diapers? That makes the huge box an awesome price! I got Huggies Snug & Dry size 5 for this project because the quality of the diapers is amazing and the price point is perfect! I wanted to use a larger size diaper for the new mom because typically they get lots of small sizes…but they will need larger sizes eventually! 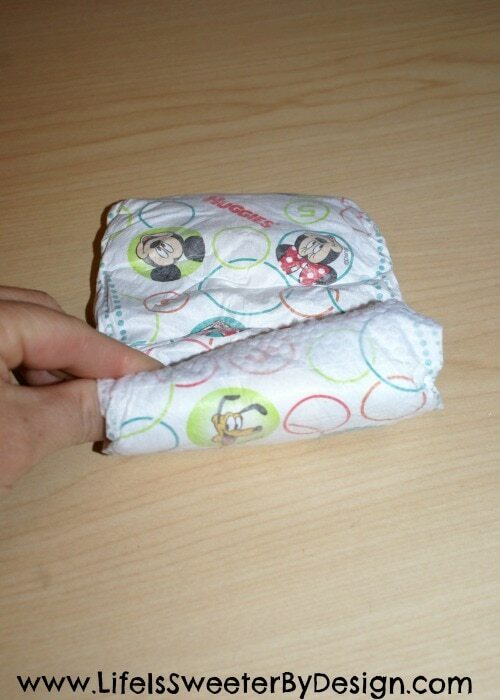 You will lay your diaper out flat, facing up. Just roll it up…sweet and simple! Now you will use a rubber band to fasten the diaper roll together. I put my rubber band near the bottom so that it doesn't show very easily when it is in the diaper bouquet. You can use any kind of clean rubber bands….I just happen to have an abundance of hair bands at my house with 3 daughters in the house, lol…so that is what I used for mine! Once you get the diaper flowers made you will take your sticks and put one into each diaper flower. I had some lollipop sticks at home so I just used those. You can also use those skinny wooden skewers if you prefer. The size of your pail will help you determine how many diaper flowers you want to make for your bouquet. I felt like 10-12 diaper flowers was sufficient for my pail. 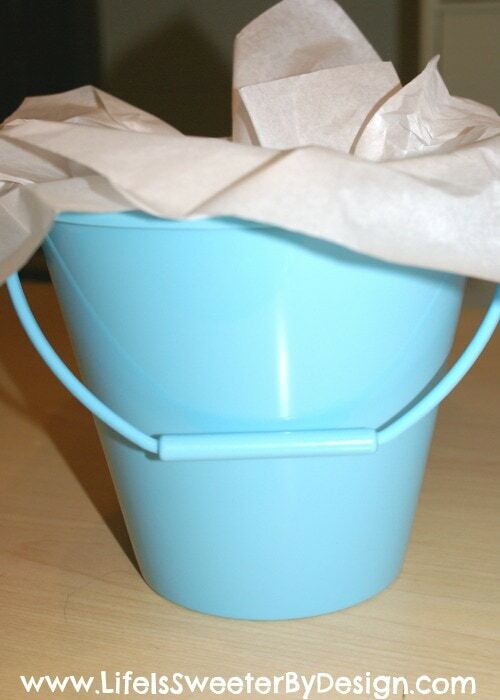 Next you want to take some tissue paper in a color that coordinates with your baby shower and line your pail with it. 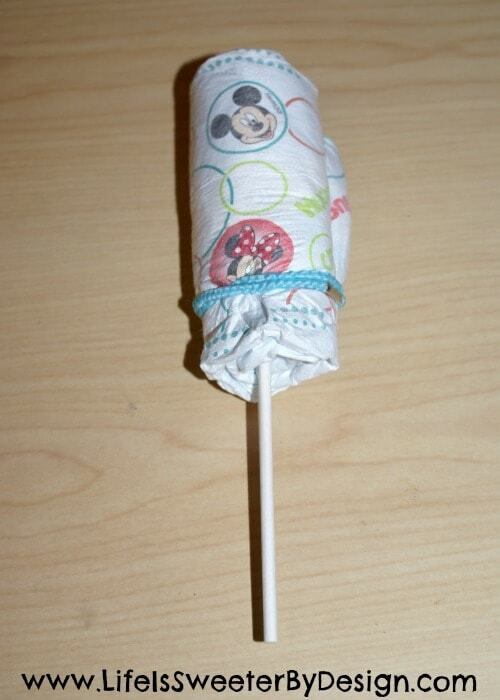 You can use more than one piece of tissue paper…just depends on how you want it to look! Tulle or fabric will also work…be as creative as you want to be! You need to put some kind of styrofoam insert into your pail so your diaper flowers are secure. 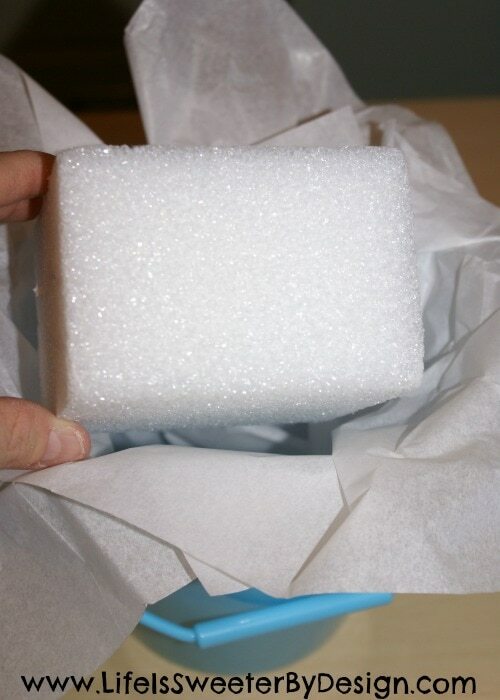 Any kind of styrofoam will work…most craft stores have a huge selection of all shapes and sizes! Just place your styrofoam into your pail on top of your tissue paper lining. 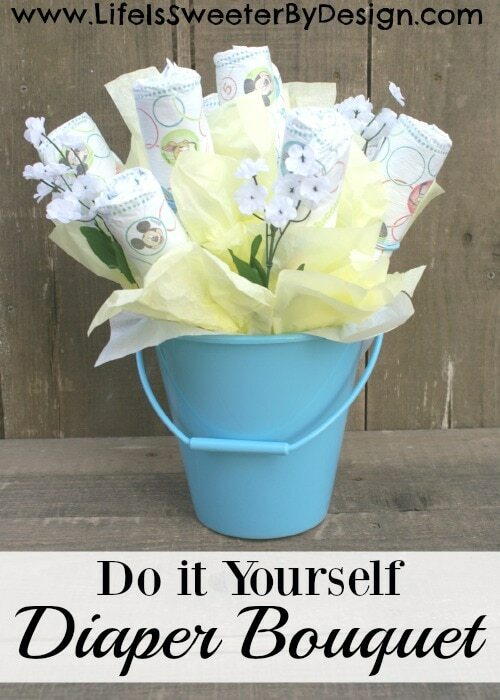 You will now start arranging your diaper flowers in your pail. When you have one where you want it to be just stick the skewer into the styrofoam to secure it in place. You will want some fillers in between your diaper flowers. You can use tissue paper, tulle or other embellishments. I got some small white flowers to add to my diaper bouquet and am also using extra tissue paper to fill the space and hide the rubber bands! There are ways you can dress your diaper bouqet up even more if you want. You could personalize the pail with the name of the baby using stickers or even a scrapbook cutting machine. You could add ribbon to the pail also! I love having something in the center of each table at a shower. I think these Pail Diaper Bouquet's are just adorable to sit on each table. There are some benefits to using diaper bouquets at your next baby shower! 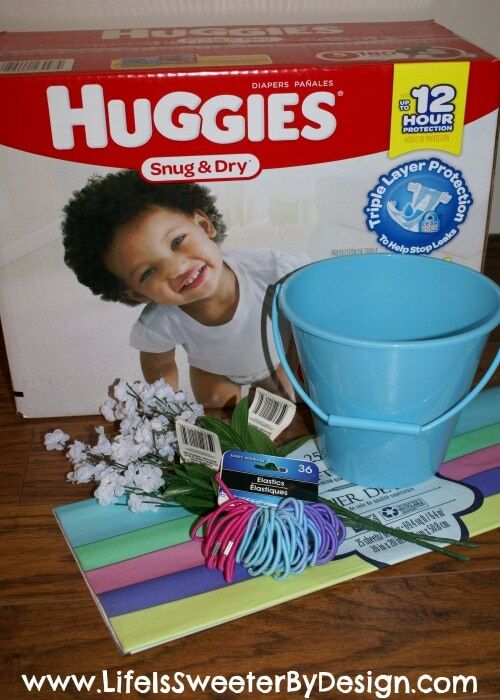 If you buy your Huggies Snug & Dry Diapers at Sam's Club you will have diapers left over after you make your bouquets. These diapers can go directly to the new mother! It is an added bonus to have some extra diapers to give her! New mom's can never have too many diapers on hand! You can bring more color to your shower by using different colored pails on the tables. You are not limited to just one color! The pails make a great organizational tool for the new mom once she gets them home! She can use them to hold baby socks, small baby toys, bath supplies, etc. If you are not a member of Sam's Club….you should really check it out! There are so many ways to save and the convenience makes it well worth it! Check out the membership details, HERE! What are your favorite ways to make a baby shower special? 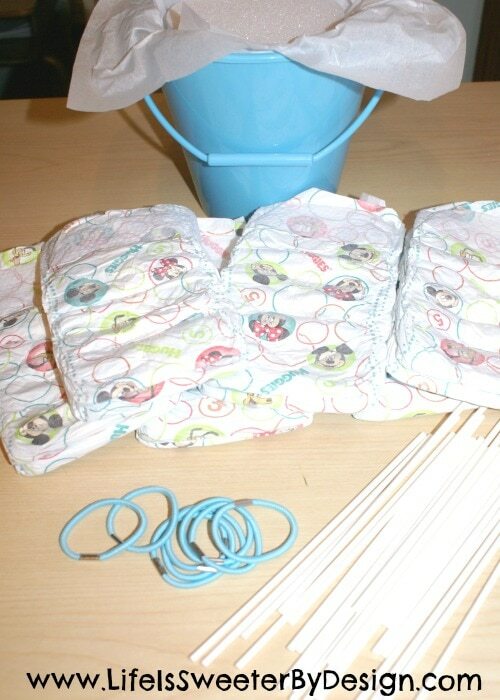 Have you even made any “DIY” projects with diapers before? I would love to hear about it! Be sure to stick around and check out some of my other DIY projects HERE! I would love it if you signed up for my weekly email updates to find out what we have been up to!! Plus you will get some great recipes for joining!! You can sign up easily HERE! What a cute idea for a baby shower. This is amazing. This is such a fun idea! Several of our friends are having babies in the next couple months. I think they would absolutely love this!